What could be more mobile than Samsung's Smart Bike? Here at PhoneArena, we pride ourselves on bringing you the most up-to-date news on all things mobile. And what could be more mobile than a Smart Bike, especially one that you can control with your smartphone? 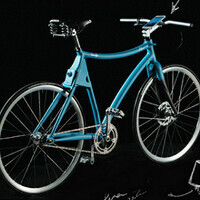 Bicycle designer Giovanni Pelizzoli worked with Samsung to create the bike, which was displayed at a trade show in Milan. According to diagrams of the Smart Bike, riders would place their smartphone between the handlebars of the bike. The phone would serve as a rear-view mirror, syncing with the camera on the back of the bike. Your phone would also control other features, such as one that uses four lasers to create your own bike lane. And you can even help discover new bike paths by sending GPS signals to the proper authorities. The Samsung Smart Bike is made of aluminum and helps absorb some of the bumps before they hit your rump. It also includes a battery, Wi-Fi and Bluetooth modules. It isn't clear whether Samsung plans on taking this unit and going into full-scale production, but it would be awfully cool to be pedaling your way around town on this modern take on the bicycle, wouldn't you agree? Please no... That's an ugly bike.. Though I guess many might like it's retro design. And a smart bike is definitely a nice idea. +1 on Ugly bike idea. I won't be selling my 'dumb' bike for a smart bike any time soon. The word "Prototype" comes to mind. Since when have you seen an awesome mock-up - like ever? The final product would be way better than this..
Yeah cause they will totally change the design in the real version (os it comes to production). Protoypes always look almost exactly like their production versions. The functionality may be different. 1: Rear view camera 2: Laser riding lines 3: GPS navigation etc Make it have reasonable pricing and I might buy 2. Almost a car with pedals, Samsung is literally in every single industry, If they release for the masses , hope they don't make too many variants like Bike 5, Bike 5 activ, Bike 5 zoom zoom etc. Anywayz haven't seen something like that in a bike so if price is right with reasonable quality it will probably sell well. Somehow what has really spoken to me is China's mass produced simple electric bicycles. Something affordable and practical so many more people can have the option of using a bicycle to commute to work/school/etc. Personally, I don't think adding "smart" to the front of many mature technologies, such as bicycles, makes them any better. The only thing I really like about "smart"watches is that they can display a calendar and notifications. YMMV of course. I know for sure they don't make literally everything. I get what you are trying to say, just don't misuse the word literally. So, whoever the genius is who put disc brakes on just the front wheel... that is an endo waiting to happen for some poor rider who has no experience with disc brakes. I see only the disc on the front, and I don't even see a v-brake on the back - no rear brakes? Somebody will be going over the handlebars when the thing flips during a stiff braking! ^^^This is why I won't be selling my 'dumb' bike for Sammy's smart bike any time soon. The 'designer' should be forced to use his abortion of a creation in the real world for a week. After the first endo, he probably will be so traumatized, that he won't ride for the rest of the week. Ever tried riding one of those up a hill? Better have received a release from a cardiologist before trying. True, those things are a beast. Flat surfaces only. Jennifer Jolly did a review of a smart bike for USA Today online. That bike has haptic feedback and a built in generator. What could be more mobile than a smart bike? Smart dust. Yes, Human are too smart and they are in need of accompany by smart objects too.